Sherlock! A review of a ‘Study in Pink’: PBS Masterpiece Mystery! I was never a rabid Sherlock Holmes fan. The films seemed stilted and the detective as conceived by Sir Arthur Conan Doyle was too old-fashioned to suit me. 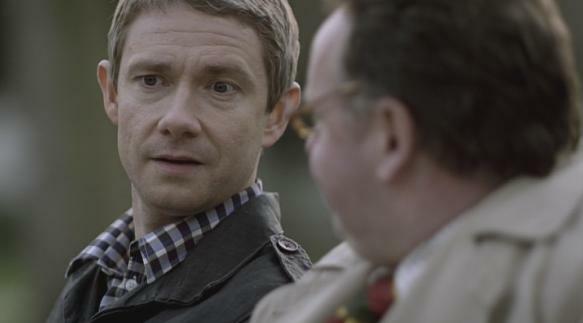 The only person I cared for was Dr. Watson. Sometimes I would feel a vague interest in a tale or two, but I never related to this strange but knowledgeable sleuth … until Benedict Cumberbatch arrived on the scene. 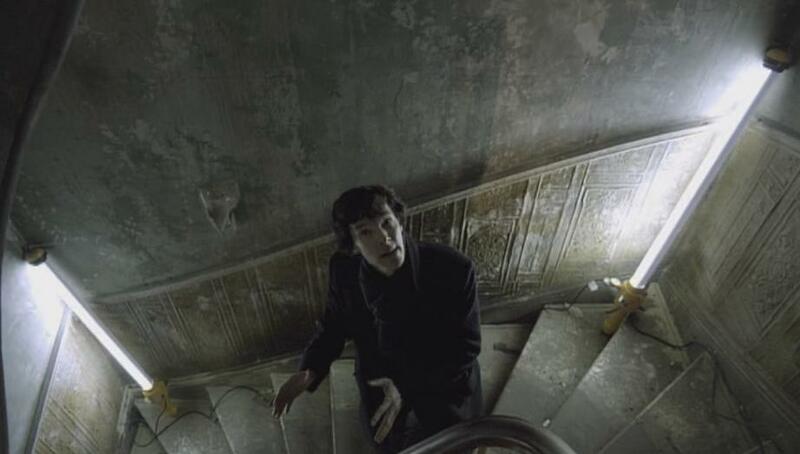 Benedict as Sherlock Holmes is close to perfect as the edgy, modern, sociopathic detective. Sherlock’s odd ticks and quirks, his quick mind and uncanny ability to read a person’s life story based on a few clues are used to great effect in introducing his character, that of Dr. Watson, and the London police force, with whom he shares a “don’t care if you hate me” attitude. To Sherlock, a crime spree is like Christmas — only made better by the possibility that these crimes may be the work of a devious serial killer. The game is on, and before it is over, Sherlock will put his life on the line — all to keep from being bored to death. Suicide or murder? 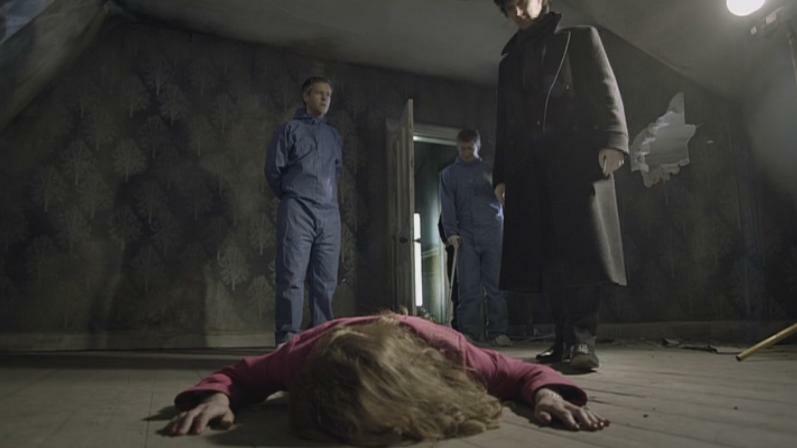 The fourth victim gives Holmes a crucial clue. A Study in Pink, a take on A Study in Scarlett, Doyle’s first Holmes mystery, is the first of three offerings in the last series this year for PBS’s Masterpiece Mystery! The script is witty, the action fast paced, and the final solution a mix of classic Sir Arthur Conan Doyle and The Princess Bride, in which Wallace Shawn as Vizzini challenges Cary Elwes (Westley) into a deadly contest in which Westley must decide on which cup holds the poison. Will Sherlock outwit the serial killer? Will Watson cure himself of his psychosomatic limp and save his new apartment mate? Will the viewer remain absolutely entertained by this intelligent, witty, and fast-paced script? Kudos go to the cinematography, which is visually exciting. I am only sorry that we will be treated to three measly scripts this season. PBS, for next year please order up a half dozen or more. 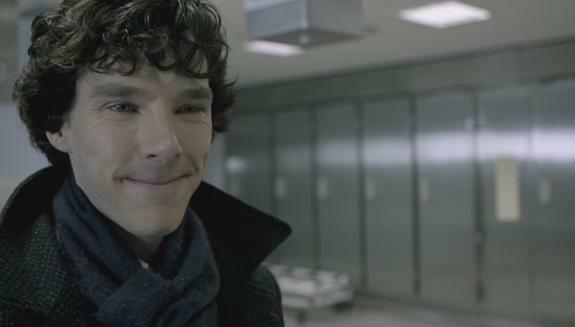 Is Tonight’s PBS Sherlock! One of the Best Sherlock Holmes’ Ever? Oh, gosh I am the opposite I always loved Sherlock Holmes as I do the Jane Austen characters. I hated this version…and I so wanted to like it! When this first came out, my first reaction was , ” Modern Day Sherlock? It can’t work,” but it does. I thought it was very good. Plenty of, “edge,” to keep you on the ,”edge,” of your seats. I enjoyed the series. Martin Freeman, who, by the way is going to The Hobbit in Peter Jackson’s new film of that title, was understated , dry, droll and very good. Benedict Cumberbatch is just the right quirky casting for Holmes too as, Vic, says. Just saw Study in Pink, wife and I loved it. Best thing on TV in a long time. Couldn’t help comparing it to the Guy Ritchie mega hit, another recent Holmes reboot. In some ways this one was more entertaining. I am very much a Sherlock Holmes fan and love it as is, so I didn’t watch this – modern Holmes, no, no, no. Reading your review, maybe I’ll take a look on line. I am also a fan, particularly of the Jeremy Brett version, so I too approached the new production with some trepidation. Not to worry. It is excellent in every way. Cumberbatch and Freeman are extraordinary. The writing is clever and the production is entertaining. I can’t wait for the next one. Jeremy Brett is my favorite Holmes, he is greatly missed. I watched this new Holmes on-line – it really is very good, I enjoyed it very much. Now, waiting for the next episode! Tout le monde a besoin d’une veste chaude vers le bas. In spite of weaknesses in the plot, the remarkable acting and witty dialogues made this a very enjoyable viewing experience — even to a life-long SH geek like myself. Mrs. Hudson is an absolute hoot! I’ll watch the series because I want to see Martin Freeman playing before I will see him in “The Hobbit” (he will play Bilbo Baggins). I’ve never seen him playing so I want to make an opinion before “The Hobbit”. I was disappointed by this modern version of Sherlock Holmes. I much prefer the older BBC 50-minute segments with their gorgeous color and traditional plots. Somehow the modern text-messaging and fast-talking Holmes seemed silly to me in last night’s Study in Pink. Great review, thanks for sharing your thoughts! I thought this show was absolute genius! I’ve long been a Sherlock Holmes fan, and this show injected fresh life in the character that I never expected to work as well and brilliantly as it did. Loved every second of it…can’t wait till next week. My own blog review is probably my longest ever post on a Masterpiece show, LOL! 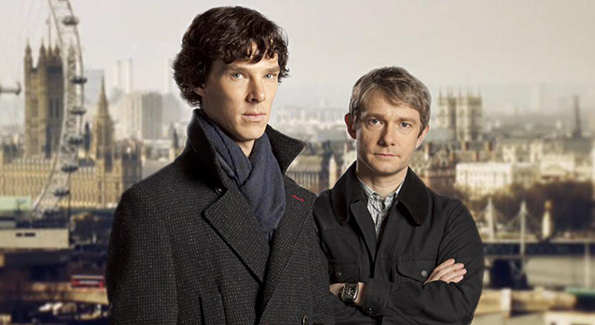 I was really afraid to watch the new Sherlock, but I think it worked wonderfully!! can’t wait to watch the next episode! I have loved Sherlock Holmes for a long time. When I saw that this was what was coming on on PBS, I almost turned it off. Then, I got sucked in pretty fast! I really liked it! I thought that Holmes and Watson were well cast. 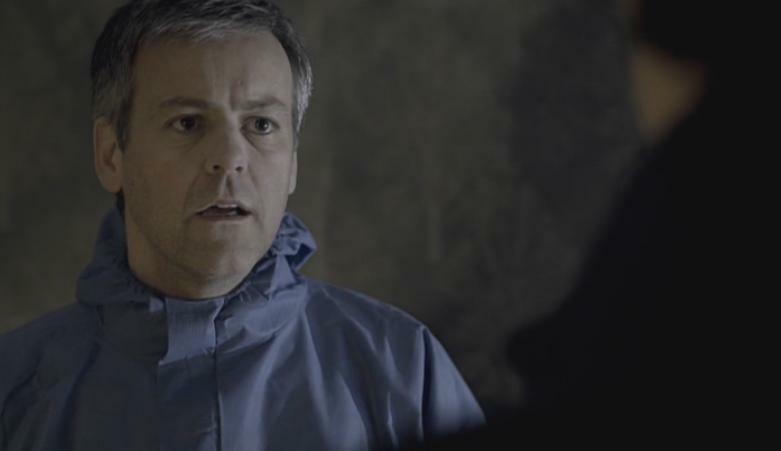 Lestrade could be a little more pompous, but maybe they can work on that. I was really impressed as I usually do not like any film version of SH, only the books! Loved it. It’s not Holmes–but it is. It has the best of the Holmes/Watson interaction, a lot of different opinions of who each of them really is–and, oh yes, a plot. Don’t really care about that. It’s fanfic. I loved it. Vic, thank you for linking to my post! I’m linking to yours as well in my review! I have come to expect the very finest from “Masterpiece Theatre” therefore, was surprised and extremely disappointed at the “new” Sherlock Holmes. Arthur Conan Doyle must be turning in his grave at the travesty, perpetrated in his name. The new Holmes with his fast-talking gibberish, might appeal to some of your younger viewers whose language skills are sorely lacking. However, those who have read the books but never seen the Jeremy Brett interpretation of Sherlock Holmes, would have been better served than by the drivel you presented. I sincerely hope that Masterpiece will not choose to provide any more up-dated and dumbed down versions, of the classics. Alas, it’s not up to PBS how many episodes are out. 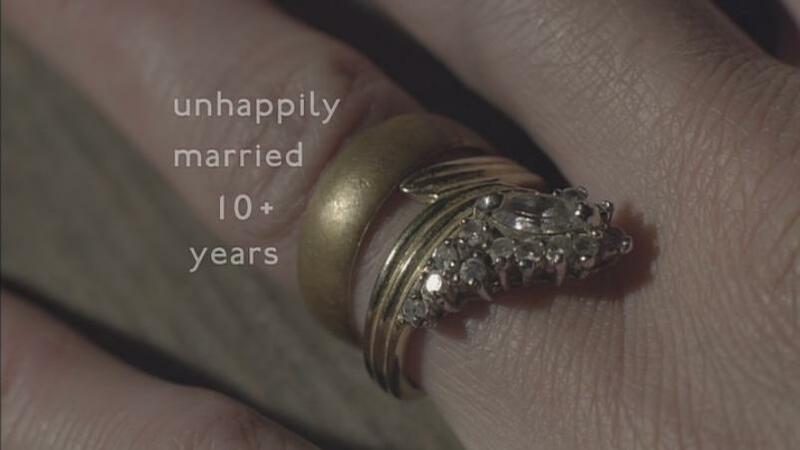 Because each episode length is more like a mini-series than a normal show, when the BBC produced it, they only made 3 episodes because – as normal airing time goes for a season on British TV – 3 episodes was a full season’s-worth of viewing minutes. 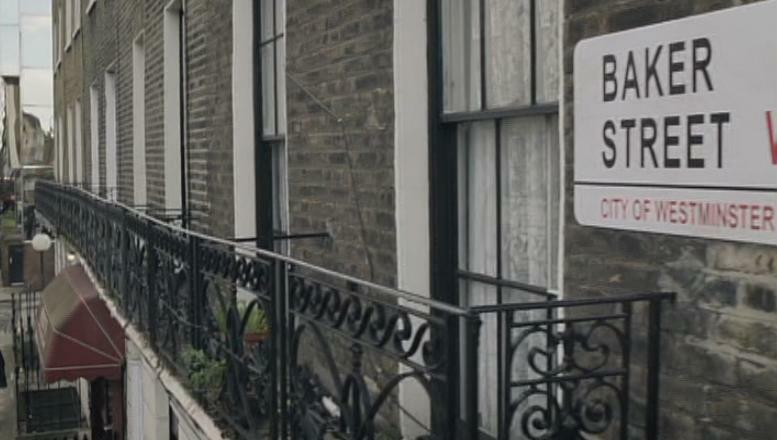 That said, though it may mean that my language skills are in question, ;) I did enjoy the new Sherlock Holmes. It’s nice to see that a character and a story can still deliver entertainment when taken outside of their normal period setting. And if nothing else, it may give incentive to an otherwise unreachable audience to start enjoying Conan Doyle on the page, not just on the screen. Oh my gosh, I LOVE Sherlock Holmes!!!! Its my favourite classic series, apart from jane Austen. My parents used to read them out to me as a kid, and now I devoured them all myself. Anyway, its lovely to see a post on it here.=) Hope they get on with the next series! I only saw the first 20 minutes of it before falling asleep. So, I really couldn’t say how I felt about it. But it did seem promising. And I liked the actor who played Watson. on November 2, 2010 at 14:49 November 2010 | HotShots! Brilliant! And unlike previous incarnations, Dr. Watson is not just a two dimensional foil to Holmes (or pistol packer on occasion) but an intriguing character in and of himself. Loved it! I NEVER watch these sorts of shows, but this was written and filmed so well. The actors are terrific! Amazing! I couldn’t stop watching!